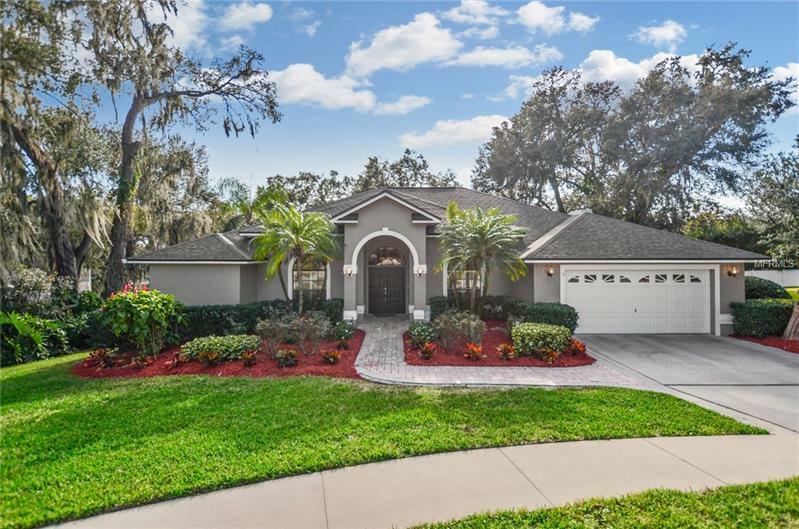 This is an unbelievable find on a stunning 4 bedroom SINGLE STORY custom pool home on almost 1/2 an ACRE conveniently located in Brandon in a small subdivision of only 15 homes! Beautiful and lush landscaping with stunning oak trees, this inviting, light and bright home features a separate formal dining and living room as well as a spacious family room with cozy fireplace. Take a dip in the GAS HEATED pool or relax in the hot tub on the pavered and screen enclosed patio after working in the garden or make a cocktail in either the of the wet bars both in the house or the patio. **This wonderful home features so many upgrades and wonderful touches like a BRAND NEW ROOF AND FRESHLY PAINTED, both bathrooms recently renovated with ceramic tile floors and DUAL VANITY sinks in each, gorgeous NEW durable, water/scratch resistant vinyl flooring throughout the living areas, plantation shutters, GIANT walk in master closet, walk in pantry, EXTRA work space in the large garage, a fantastic laundry room with basin sink, PAVERS on front walkway, raised ceilings and ceiling fans! ** Enjoy the serenity of this wonderful and peaceful oasis where you can relax away from everything but all of shopping, dining, nightlife and everything that Brandon and Tampa have to offer are mere minutes away as are I-75, the crosstown, USF, our award winning beaches and all of the Bay areas great sporting events!